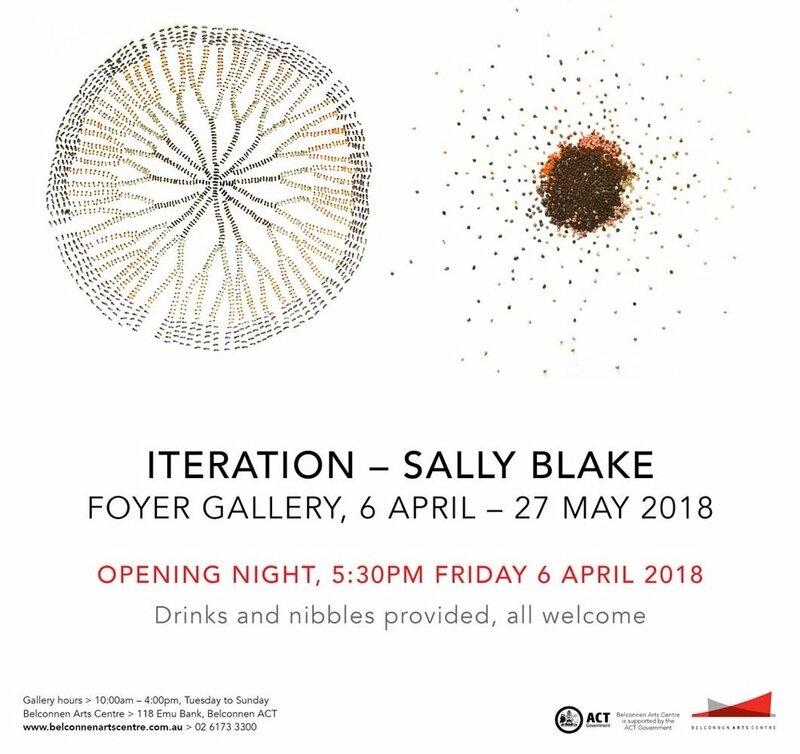 Iteration is an exhibition of drawings I have made in the past 8 years. In all of the works the use of repetitive processes is evident. Entangled Mysteries is a new body of three-dimensional textile works and drawings by Sally Blake. The works reference author Craig San Roque’s story, The Kore Story / Persephone’s Dog, and the ancient Greek myth of Demeter and her daughter Persephone. These stories teach us about cyclic patterns of decay and renewal and seasonal changes. This exhibition focuses on the time Persephone spends underground, where she can learn to understand how the world works and how plants grow from below. 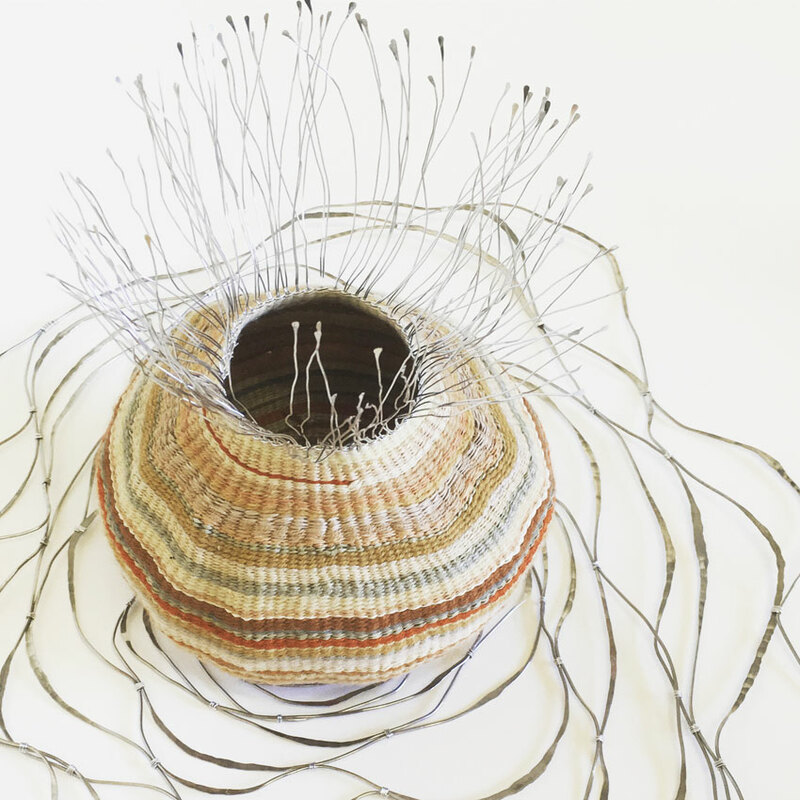 Using contemporary basketry practices and paper-based media, I have created an underground world which harbours the potential for renewal and for new life in the darkness. My work Eucalyptus Mantle is now showing in Open House. For the Tamworth Triennial, friends and colleagues have collected eucalyptus leaves and bark from each state and territory. I have recorded the dyes on wool, silk and linen cloth and have used a number of mordants to create a range of colours. The eucalyptus dyes become a record of place, the colours mapping the biophysical conditions of a particular place, at a particular time. Each Mantle is based on a weave structure, referencing weaves that might be used for a cloth mantle. The use of multiple colours makes the structures and patterns difficult to see, and the eye keeps moving across the works’ surface to find the connections and relationships between individual elements. These intricate patterns are analogous to the complexity of natural patterns which both reveal and conceal themselves from discovery and understanding. The inclusion of Broken Mantle is cautionary, as the impacts of ongoing climate change will affect these robust and iconic Australian species. Over the next 70 years it is likely that the habitats of more than 90 per cent of Australia's gum tree species will on average halve in size, and 16 eucalypt species are likely to become extinct due to global warming. Broken Mantle visually explores the implications of such changes. In 2014 and 2016 I had artist residencies in Namadgi National Park, ACT. The theme of the residency was the environmental protection of the alpine bogs and fens. A particular focus was the seed collection done by the Australian National Botanical Gardens for their seed bank to preserve plants endangered by climate change. The role of these environments in water filtration was also a significant area of research. As I visited the bogs and fens I wondered at their fecundity and the abundance of plant life. With permission I collected plant samples from these environments to be processed for their dyes to make a unique record of place. Seep is coloured almost exclusively with these dyes, celebrating the richness of the flora. The aluminium prongs sprouting from the basket/bog reference the continual regeneration of plant life. The patterns of aluminium wire ‘seeping’ from the work are mimetic to the release of filtered water from the bogs and fens. Naturally Yours is an exhibition of work addressing environmental issues by early career researchers at the Australian National University School of Art & Design. Changes to the natural environment and speculation on its possible demise are conspicuous in investigations by contemporary artists. The exhibition is intended to reinforce how art offers an opportunity to explore complex questions in imaginative and accessible ways. It will reiterate that artists are instigators, thinking about problems and issues relevant to many of us. I have my Eucalyptus Mantle and Broken Mantle works in this exhibition. The Eucalyptus Mantle series emerged out of an intensive period of researching the eucalypts at the Australian National Botanical gardens for their dyes. Eucalypts are integral to the Australian environment and are found across the entire continent. I came to think of them as a mantle cloaking the country, their roots holding the soils and their leaves and branches providing habitat and shade. I made thousands of colours from the leaves and bark of 230 eucalypts. The Eucalyptus Mantle works are made from linen, wool and silk dyed during the project. The pattern references weave structures that might be used for a cloth mantle. Over the next 70 years it is likely that the habitats of more than 90 per cent of Australia's gum tree species will on average halve in size, and 16 eucalypt species are likely to become extinct due to global warming. Broken Mantle visually explores the implications of such changes. Carlos Gonzalez-Orozco, “Phylogenetic approaches reveal biodiversity threats under climate change,” Nature Climate Change 6 (2016), 1110-1114. In Memory was selected for the Bay of Fires Art Prize. In a small chapel in Launceston are three urns holding the ashes of my mother, grandmother and a grandfather I never met. Launceston is enfolded in my memory and I travelled there often as a child to visit my grandmother. She lived near the Cataract Gorge, in a home overlooking the Tamar. I remember many happy walks with her in these beautiful environments. My last trip to Launceston was to bring my mother’s ashes home. All the threads in my baskets have been dyed with eucalyptus leaves and barks sourced from Launceston, infusing the work with place. Eucalyptus dye workshop at the Australian National Botanical Gardens. An exhibition of eucalyptus colour specimens and artworks. My solo exhibition at the Australian National Botanical Gardens (ANBG) Gallery, The Colour of Eucalyptus will feature textile, basket and paper-based works that have arisen from my eucalyptus dye research undertaken at the ANBG. During the project I recorded the colours from the leaves of 230 and the bark from 100 eucalypt species. Each dye has been recorded on a small pieced sampler made from 7 different fabrics, as each fabric shows the dyes uniquely. Together these samplers create a Dye Diary. The leaves which create these wonderful dyes are also highlighted in pressed leaf arrangements on paper. Three leaves from each plant have been glued to paper to create large visual records of the leaves which supplied each dye. A small basket series, Hidden Mysteries has been made using a range of threads, each woven from the colours of one eucalypt species. Using plant dyes is a mysterious process emerging between the plant materials and human intervention. Many eucalypts give unexpected results such as bright oranges and reds on wool. I will also exhibit my Eucalyptus Mantle works. I came to think of eucalypts as a mantle cloaking the country, their roots holding the soils and their leaves and branches providing habitat and shade. The Mantle works are made from the thousands of colours created on linen, wool and silk dyed during the project. The pattern references weave structures that might be used for a cloth mantle. Through my textile and paper-based practice I explore the complex relationships between the human and natural worlds. To reveal these connections I work with natural processes and materials such as rain and plant-dyes in the creation of artworks. I am interested in the deep structures and patterns in the natural world and work in ways that allow them to emerge in my work. At times natural phenomena such as rain make the patterns in my works, and at others I use small repeated processes and marks to build up patterns. Like the patterns in nature these patterns are made from many similar, though not identical marks, and there is a sense that there is something regular, or at least not random, about them. In Patterned I am exhibiting works across a number of mediums and techniques. These include weaving with copper wire, colouring cloth and threads with plant dyes and using ink, rain and burns to mark paper. This allows me multiple means of exploration and multiple ways of expression. As the exemplar of high Modernism, the grid is ubiquitous within contemporary life in instances as varied as the structure of city buildings and streets, to the graphs of financial indexes and the organisational logic of museums, libraries and supermarkets. But just as the grid can be seen as a device implying control and rigidity, it can also been seen as an agent of movement and change. A grid is the form of many textiles, of nets which allow the flow of water as well as the containment of a catch, of the rhythms and patterns of the natural world. The artists in "Off Grid" respond to these ideas and more, some taking the history of the grid with modern art as a starting point, others exploring the potential for the grid to make sense of the richness and immensity of the natural world and others still making use of the grid as a form of logic to structure visual a material. The artists - Emma Beer, Sally Blake, Julie Brooke, Kirsten Farrell, Jay Kochel, Al Munro, and Wendy Teakel - work across a range of media to demonstrate the ongoing relevance of the grid within contemporary art. For my solo exhibition, Fire and Rain, I have developed works on paper and canvas that explore the material possibilities of these elements and their capacity to shape the natural environment. Throughout history humans have endeavoured to harness both water and fire for their own comfort, safety and food production. Rain (including drought and flood) and fire events are becoming more frequent and severe due to human-induced climate change. Raging bushfires, flooding and perfect storms are a reminder that these natural phenomena are largely elusive to human command. I am part of Earth, an exhibition where artists explore how the earth sustains them spiritually, physically and emotionally. The exhibition is curated by Benita Tunks. Costa Georgiadis, Host of Gardening Australia will open the exhibition on Friday 19 August at 5.30 pm. Sally Blake, Earth Cores (detail), 2016. Patinated copper wire. I have received an Australia Council Grant to undertake dye research on all of the Eucalyptus, Corymbia and Angophora (the 'eucalypts') at the Australian National Botanical Gardens. There are approximately 450 species held at the ANBG, and I have been busy since June collecting leaves and bark for their dyes. I am very grateful to the ANBG and Australia Council for their generous assistance and support of this project. As part of this research I will be making an online database of the dye colours. Soon (in October) I will begin to upload the colours I have collected so far. The Canberra Museum and Gallery purchased three of my Seed Baskets. They are now exhibiting as part of Bush Capital. See http://www.cmag.com.au/exhibitions/bush-capital-the-natural-history-of-the-act for more details. Seed Baskets, 2014. Silver wire, plant-dyed wool, silk and bamboo. Approximately 12 x 4 x 4 cm each. Blake Prize Directors Cut, Online Exhibition. So happy to hear that I will be heading to Hill End for the month of May to live in Murrays Cottage. I am planning to make a new dye diary from the local plants, and to continue experimenting with 3d woven structures while I am there. Dye Diary (pieced works) , 2012. 2015 City of Hobart Art Prize at the Tasmanian Museum and Art Gallery. From 18 September to 29 November 2015. The Ecological Thought represents the vast, entangling mesh which connects all living things. The crocheted paper surface is redrawn on the wall, abstracted and re-articulated in shadow, contingent upon the lighting and environmental conditions of the space. The shadow interacts with the work to create a complex and intricate whole. Professor Timothy Morton writes “…the ecological thought is the thinking of interconnectedness.” Timothy Morton, The Ecological Thought (Cambridge, Massachusetts: Harvard University Press, 2010), 7. 2015 Hutchins Art Prize at The Long Gallery, Salamanca Place, Hobart. From 8–20 September 2015. Tempest, 2015. ink and rain on paper. 100 x 100 cm. 2015 City of Albany Art Prize at Albany Town Hall, Albany. From 5th September to 11th October 2015. My work Night Cloud has been selected for this years Albany Art Prize.